I have recently been reading a lot on the "Mercersburg Theology" which arose from conservative Presbyterian theology in Pennsylvania in the mid 19th century. The two primary proponents were John Williamson Nevin, and the noted church historian Philip Schaff. 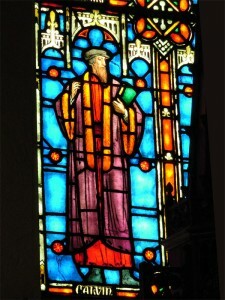 The main thrust of Mercersburg theology was the quest for a reformed Catholicity. This was promoted through the use of historic liturgical practices and a recovery of the sacramental theology of John Calvin. The most important book written by Nevin titled "the Mystical Presence" defends a view of the Lord's Supper which proposes that their is a real partaking of Christ mystically through faith in the Eucharist. Though negating the Roman Catholic and Lutheran insistence on the local presence of Christ's human nature, Nevin argues against the popular Zwinglian Princeton approach to the sacraments that one partakes of the whole person of Christ through the sacrament. This partaking involves the mediating work of the Holy Spirit, wherein mystically the Christian is raised through faith to partake of Christ's whole person. This act offers and brings forgiveness to the recipient. Nevin's view of the Eucharist is heavily dependent upon his insistence that salvation is both legal and ontological. Integral to salvation is mystical union with Christ. This goes beyond the legal/covenantal union that many propose, and approaches the real-ontic union idea of Mannermaa. For Nevin, the benefits of Christ cannot be separated from his person. Thus, the benefits of redemption involve mystical union and participation in Christ which is exemplified in the Eucharist. Another emphasis of the Mercersburg theologians was the insistence that salvation comes through the church. The strict visible/invisible church distinction of Hodge personalizes faith to such an extent that participation in the external church becomes almost a matter of preference, being separated from an individual act of faith which occurs apart from the ecclesiastical community. There was a lengthy debate between Hodge and the Mercersburg theologians which would ultimately determine the future of the Presbyterian tradition in America. Hodge viewed Christianity as essentially adherence to specific doctrines, thus the purity of the church depended upon its acceptance of correct doctrine. Nevin and Schaff argued for a more organic view of the church, wherein the Christian faith is not centered in doctrine but life. This does not mean life as in moral transformation as in Ritschl, but the life of Christ and the eschatological life that he communicates through his person. Thus the church as an organic institution continually grows and becomes more sanctified. In the minds of the Mercersburg theologians, this would hopefully eventually result in the reunification of the church: Catholic, Orthodox, Lutheran, Anglican, and Reformed. Ultimately, of course, the Mercersburg theologians were on the losing side of the debate. While Nevin's historical work regarding the Eucharist far outweighed Hodge's for a purely symbolic understanding, it was ultimately the Princeton tradition which would define Reformed theology in America. I find it fascinating that there was (and remains) a movement toward catholicity within the Reformed tradition. I find this encouraging, but ultimately I don't believe that Reformed theology can solve the desire for catholicity. Nevin's emphasis on the incarnation as the paradigm for church life is correct, but ultimately cannot be sustained on Reformed principles. The Zwinglian principle that "the finite is not capable of the infinite" negates the possibility of a true Reformed catholicity. An incarnation-centric theology like that of Nevin and Schaff ultimately cannot stand within the Reformed tradition. To do so is to deny the central principle which divided the Lutheran and Reformed branches against one another. If you deny this principle, can you still be said to remain Reformed? I don't think so. It is not surprising to me that the Puritanical/ Princeton type of Reformed theology has been predominant. Attempts such as the Mercersburg movement and the Federal Vision movement to strike a balance between the two positions is impossible. Consistency ultimately must lean one toward Lutheranism or Princeton & Puritan theology. Either the finite is capable of the infinite or it isn't. There is no middle ground on this essential issue. Thanks for this. It is an eye opener for me. From your Patristic studies, which is more in line with majority understanding? - the Lutheran or the Reformed view? The majority of the church fathers hold to real presence, sometimes in the Lutheran sense and sometimes transubstantiation (though without all of the Aristotelian language). Some have argued for a Calvinistic view in Augustine, which may have some merit. There are certainly places in his writings which sound like Calvin on this topic. Tertullian is the only one I know who held to a symbolic view. Jordan - a point of correction and maybe one for further study. Nevin and Mercersburg were not part of the Presbyterian church, but the German Reformed Church. Nevin did start out Presbyterian - attending Princeton - but moved to the German Reformed when he went to Mercersburg. There is a Mercersburg renewal in several different theological circles, so their influence is being revived. Thanks Michael; I should have said "Reformed" rather than strictly Presbyterian.